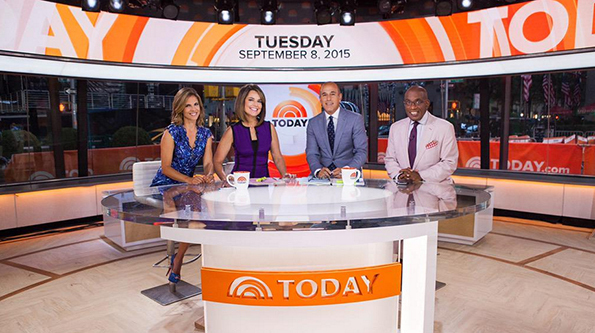 NBC’s “Today Show” updated Studio 1A in September, brightening up the design with a refreshed look from Jack Morton PDG. Combing some old and some new, the design reinvigorate the space, keeping its mid-century style with a better use of the space and technology. 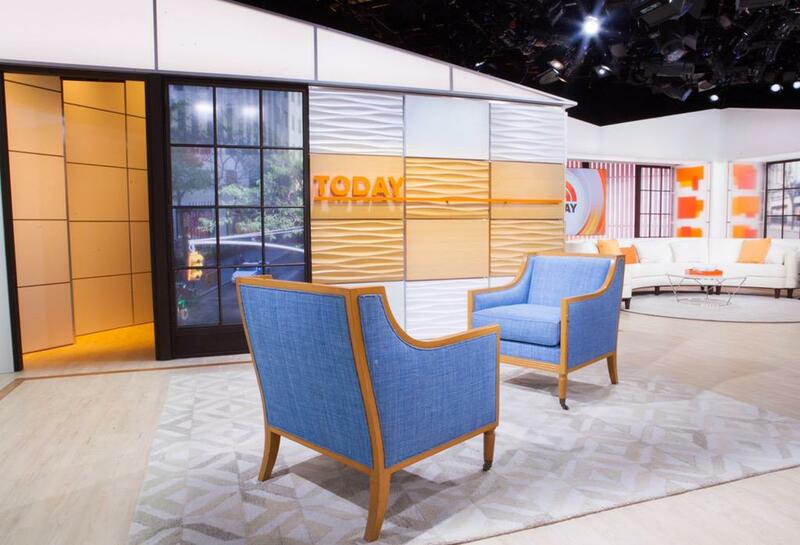 Leading the project for Jack Morton PDG was Camille Connolly, who’s no stranger to morning show set design, having worked on the upstairs set for “Today” and “Good Morning Britain.” We recently had a chance to talk with her about the project and “Today’s” rebirth of Studio 1A. What objectives did the producers set for the project? 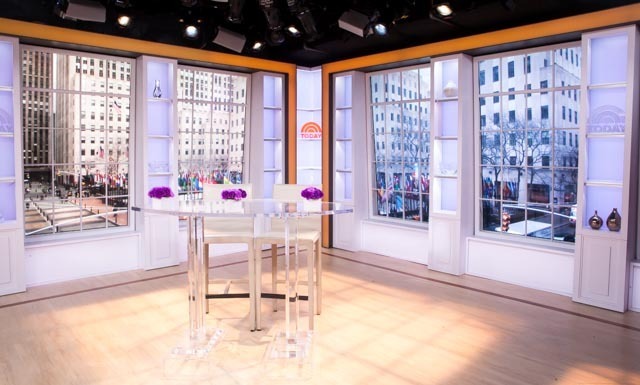 The producers at NBC were looking to give the studio a lighter, brighter, more invigorating and modern look. They loved what I did in the upstairs studio, especially the lighter floor and the windows that double as graphic monitors, and wanted to bring that idea to the main set. They also set two other goals for the project: shooting the show in the round, and increasing the footprint for interviews so that the space was much more usable. As it was, the interview area was almost never used for interviews because there wasn’t enough space for cameras to turn around quickly. Where did you draw your inspiration for the project? I looked at modernist spaces that bridged the gap between home and loft style living. There was already a strong mid-century modern style to the shapes in the studio, some of which did not change, so I looked for ways to blend those shapes with the new ideas. Specifically, the roof/header piece. In the original design, the roof is a very groovy shape, but it’s mass made the space feel closed in. In several areas, we flattened the shape, turned it into a lightbox and broke it up with vertical metal framing which helped alleviate some of that heaviness. 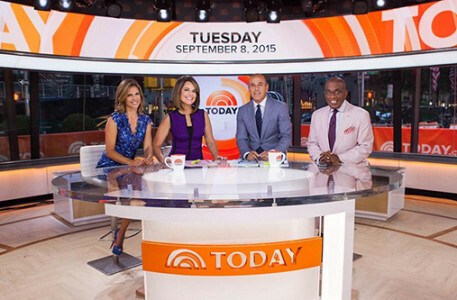 With a brand like “Today,” how did you refresh the design while still keeping it “familiar” ? To start with, we did not change the view. The iconic view of 30 Rock behind Matt and Savannah didn’t change, in fact, we opened it up by removing a blacked out section on camera right and added a few graphics on the opposite side of the set to help remind us of the studio’s location. By designing a desk that shoots in the round, we actually helped find other views out on to the plaza. Talk about working with another designers footprint as a base? What kind of challenges did it present? To change and adapt what’s already there takes patience and a deep delve into the previous design’s motives. It was very interesting to me to find out what could and could not change within this set. One major factor was the ceiling/roofline. It is such a strong statement and really informed how the floorpan worked, that we really couldn’t change it’s footprint. Every wall was based off of how those triangles intersect. Once I figured that out, I could move through the set changing walls, materials, and finishes. 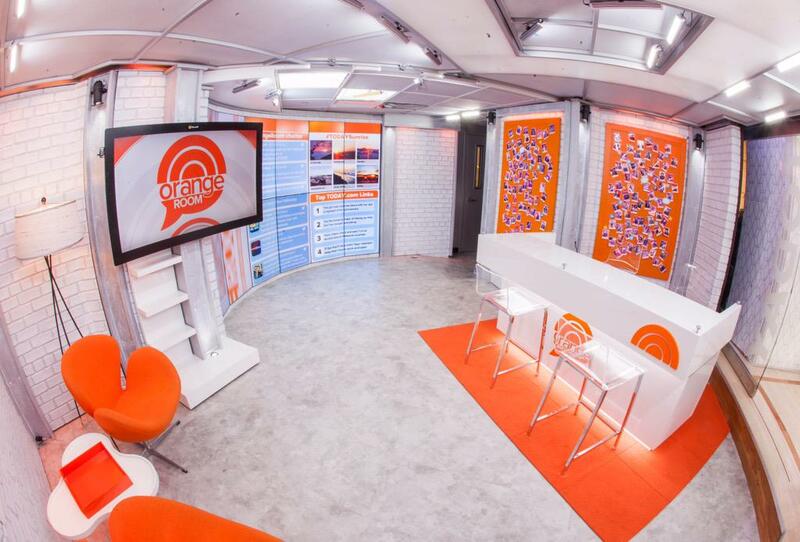 The Orange Room plays a big part of “Today’s” social broadcast, how did you enhance it? The major upgrades to this space were opening it up so it no longer had artificial dividers and joining all the bezel-less monitors into one larger video wall. This area took on more of a “loft” workspace feel, by giving it white washed brick walls, concrete tile flooring, and a clean modern style work desk. A major improvement was changing out the lighting for low-profile units that blend into the ceiling. But the spaces personality stayed in tact with the props. There are 2 “orange boards” that the show has been collecting Polaroid’s on for years, orange furniture, and framed art in the space. 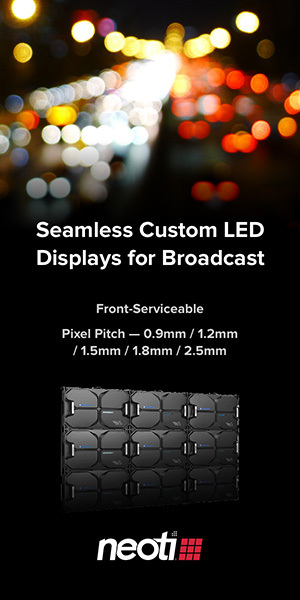 Anything interesting or unique about the project you’d like to reflect on? As with most projects, timing is a huge factor. “Today” has the added timing constraint that all the load in work had to be completed in 2 weeks, including set install, lighting, and rehearsals. Everyone worked around the clock and chipped in when things got tough. All my partners in this business went above and beyond. Showman Fabricators built the set, Bruce Ferri of FLDA did the lighting, NBC Night crew did the install, and of course, Marc Greenstein, producer, and Margot Silver, associate producer, were there more then anyone. It was a project where everyone lifted everyone else up, and I am incredibly happy to be part of it.